Several years ago I was working at my first ever real job. I’d had a million small jobs in high school and college, but this was my first job after I finished school and was out in the world ready to make money. This was my first job in my chosen field. Up until then I had done very little to save for retirement. The year was 2007. I recall vividly the day I went down to the benefits office to submit paperwork for my employer-sponsored retirement account. Not only did I want to set it up, but I wanted to contribute 25% of my pre-tax pay. This was before we had decided to get serious about ditching our debt, so we were still making the minimum payments on our student loans at that point in time. Now, you and I could debate all day long whether it is a wise idea to contribute large amounts to retirement savings while making minimum payments on student loans (at the time we felt it was a good idea because our loans are locked at 2.5% and 3.5%), but the point is that the hubs and I had decided that we had wasted too many years either in school or working at jobs that did not offer retirement benefits and it was time to get serious. We were 26 and 30, respectively, and together we had almost nothing saved for retirement. We felt like we were really behind the game. So I went down to the benefits office and asked for the paperwork that I needed. I took it home and completed it and a few days later I was trotting back to the benefits office to submit the paperwork. On the paperwork I’d had the option to write in a specific percentage that I wanted taken out of my check every month OR I could check one of the pre-printed boxes that offered options like 3%, 5%, and 10%. When I turned it in the guy who looked it over (who was about my age) said, “Wait, you forgot to put a check by your percentage.” I opened my mouth to respond, but then he saw my 25% written in. I’ll never forget what he said to me next. I was so amused and irritated by the question. To this day I remember my response. I think the reason why I was irritated with his question was that, by asking that question, he had insinuated that I was doing something really strange and out of the ordinary. I bet you anything if I had met that guy in a different location, such as a car dealership, he would not have thought me strange if he had seen me doing something like buying a brand new expensive car and financing the whole thing at 8%. He probably would have thought that was normal. My advice to everyone out there about saving for retirement? Endeavor to be strange. Seriously. This is an area where you do not want to fit in with your peers. At all. As we hear nearly constantly in the media, most Americans do not have even close to enough money saved for retirement. 1) Always contribute to your employer-sponsored retirement accounts AT LEAST to the point of the employer match (if you are lucky enough to have one). If you do not do this you are turning your back on free money!! 2) Consider Roth IRAs (for those of you in the US), which are an awesome way to save for retirement once you are contributing to the point of the match in your employer-sponsored account. These retirement vehicles are for post-tax dollars (in other words, money that you’ve already paid taxes on). Because of that, you will one day be able to withdraw your money (plus growth!) without paying taxes again. Pretty sweet. 3) Make it a goal to ratchet up your savings rate by a percentage or two every year (assuming you start out contributing to your retirement account at a low percentage). Contributing a larger percentage such as 15%, 20%, 25%, or even more is a great goal if you can manage it, but is not for everyone (we were lucky to have great jobs, live in a low-cost area, and have few expenses during those years I described above). Contribute as much as you can- your future self will thank you! These days we are enjoying some nice balances in our retirement accounts because we were able to put large percentages in our retirement plans during the years of the financial crisis when the stock market was at a low. 4) Start saving as early as you possibly can. As in from your very first job and the very first month that you are eligible to participate in the retirement savings plan. You will be able to enjoy the fruits of your labor (and the magic of compound interest!) more if you start early. 5) Pay no attention to your peers. Most people out there are probably not going to be working as hard to save for retirement as you are. That’s ok. You may not have as many flashy toys as your peers, but one day you will likely be living a much more comfortable and satisfying life because you put in the effort to save now. My favorite FREE resource to help you manage/budget your money and plan for retirement is Personal Capital (review here). Before you start telling me that we should have been contributing to Roth IRAs instead of contributing 20% to employer-sponsored retirement accounts, don’t worry. We maxed those out that year as well. Those were the good old days when our expenses were super low (before we realized that we would be having children the expensive way and began putting money toward that). Also, in the years since then we’ve changed our financial tune somewhat in that we are now working hard to ditch the student loan debt once and for all! How are you doing on your retirement savings goals? Are you working hard to be as awesomely strange as you can possibly be??? Suggested Reading: One of my favorite books about forgetting the Joneses and livin’ the “stealth wealth” lifestyle is The Millionaire Next Door: The Surprising Secrets of America’s Wealthy (affiliate link). If you have not yet read this book I HIGHLY recommend that you check it out! P.S. If you liked this post, you might enjoy using our free Net Worth Calculation Template. Sign up now to receive each new post delivered to your inbox, and we will email you the template! Sign up here. Retirement Savings by State- How’s Your State Doing? Financial Independence or Early Retirement: Which Road Are YOU On? Last year was the first year I ever maxed out my retirement account and it felt great. I really do wish I would’ve started sooner, but we didn’t start saving for retirement until our late 20’s. Same here, although to be honest we didn’t really have jobs that offered retirement benefits until our late 20s anyway. I could have been saving in a Roth then, though. I’m 25 now and I know that of my closest friends, I am the only one who contributes more than than 15%. Two of my girlfriends contribute nothing, and the third contributes less than 10. It’s not good. I know, I think for a lot of folks in their 20s the general feeling is, “I’ve got years to save for retirement.” And while that may be true, I think few people realize that putting more away when you are young means less that you’ll have to put away when older because of the magic of compound interest. I like the ‘increase your savings rate’ goal you proposed here. It’s not something I’ve done, but it’s a realistic change that most can make each year. Going from, say, 5% to 20% sounds unrealistic. If you go from 5 to 7 to 9..etc. it seems much more realistic. Exactly! And it’s such a small percentage that you may not even notice that much! Gradually you can work your way up to a really impressive savings rate. I would think that he considered it strange because he sees everyone else’s paperwork and they are probably at 3% or 5%, so your’s was out of the norm. There is nothing wrong with that though. I have a Roth and a 401k that I contribute to each year. I started saving in my company 401k at 22, and I am definitely thankful that I saved early, but now at 35, I wish I saved more in non-retirement accounts as well. I think that everyone should strive to save 20% at least and find the right balance between retirement and non-retirement savings, because for anyone under 40, retirement will likely be 30+ years away and you have a lot of life to live between now and then. You make a really good point. We keep track of our passive income every month and we usually count dividends and capital gains, but it dawned on me a few months ago that the vast majority of the dividends and capital gains that we earn are in retirement accounts, which we cannot access until we reach 59.5. It’s really made us start to think more about accumulating assets outside of retirement accounts so we have assets available to us before then- because hopefully we will be in a position to retire early! Unfortunately my company only allows you to sign up for benefits and 401k’s once a year and you have to be hired for a whole year before you can sign up. =/ The 401K sign up was the first week of January and I was hired at the end of January. So I have to wait till next january to start my 401K. Frustrating. At least I’ll still be 22 and that is still early I think! Can’t happen soon enough though! Bummer! You can contribute to a Roth IRA this year though! It’s not as much as you could probably put in a 401(K), but Roths are pretty awesome. You might want to check it out if you haven’t already. My favorite part of this post is the “pay no attention to your peers” part. It runs through your story, too. Obviously, you spoke with someone who did not view what you were doing as ordinary or right. Because that’s how so many of our peers think, it’s so great to have a post like this reinforce the notion that saving more for retirement early on is critical to saving enough for retirement. 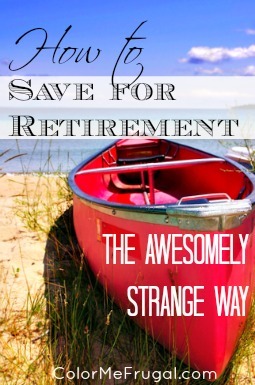 It continually amazes me how many people are not doing much to save for retirement! I wish things like compound interest were taught better in school- or that more parents were better educated on the subject. I agree, strange–in the sense of unusual–is good when it comes to money management and saving. I once had a job that allowed me to put 100% of my (modest, part-time) pay into a tax-deferred account. We didn’t need my pay for current living expenses, so why not? I bet the management thought I was really strange! “…he had insinuated that I was doing something really strange…” That should just serve as a sign to you that you were doing something right. I received this same feeling the other month when I walked into the bank to pay off our mortgage. They were surprised I had been putting so much money towards paying it down instead of drawing it out to take advantage or our low interest rate. Keep being strange! I know, it’s really crazy, isn’t it? I don’t know how our culture has evolved to the point that debt seems normal to everyone these days. Years ago folks like my grandparents and great grandparents would have hated being in debt to anyone, but these days all kinds of debt is the norm. So much that people think you’re weird or strange if you go against the flow and pay it off or avoid debt! I am in complete agreement that being strange is the way to go! Right on Dee! I’ll gladly take being the weird guy who maxes out his 401(k) if it means I’m wealthy and retired while everyone who thought I was a nut job is still working. Like Patton said, if everyone is thinking alike, then someone isn’t thinking. Ha! Love the Patton quote. I definitely think the “weird” people often come out ahead, ESPECIALLY in the world of personal finance! Spot on! I hate when people think there is something wrong with you because you want to retire some day. I’ve had co-workers ask me dumb things like “what? don’t you like working here? Don’t you like your job?” What loaded questions! Only a fool would buy into that kind of mentality and not take full advantage of their retirement savings options. I’m very strange – I save the full amount every year! That’s hilarious that your co-workers have actually asked you those questions! The more that I think about it, the more that I really scratch my head and wonder how everyone came to believe that working until 65 or 70 is the only way to do things. Is it lack of imagination, creativity, opportunity, knowledge, work ethic? All of the above? I TOTALLY think there’s a different way to do things if you work hard and start early! It’s definitely interesting talking to other people my age and realizing I might be one of the few who contributes to a retirement fund. It seems so far off and like you have enough time, but in reality, time is somewhat on our side. I know, I recall a few years ago telling someone about a stock I was watching that I wanted to purchase some shares of. She looked at me wide-eyed and informed me that she did not know ANYONE else our age who owned stocks. And I agree, when you are young time is totally on your side in terms of investing! Good for you – 20% is awesome. I think minimum should be 8% or 10%, and especially the highest amount the company will match. And may I offer some other advice to you young’uns from the older and wiser club? Watch your investments and get comfortable with the market. I ignored my portfolio for the longest time. I had no idea what was happening with it. Now I’m trying to learn, and grow it with dividends while still contributing. Great tip! My hubby and I have been doing our best to educate ourselves about the financial markets and watch what the market is doing (although some days we have to remind ourselves not to watch TOO closely or get too caught up in the day-to-day variations). It can be a lot to take in, so it’s a good idea to just try to absorb it and grow your knowledge over time. Great post, Dee. I agree with everything but this might be my favorite – “These days we are enjoying some nice balances in our retirement accounts because we were able to put large percentages in our retirement plans during the years of the financial crisis when the stock market was at a low.” There were so many people who pulled their money out of the markets or stopped investing during the Great Recession. And not because they lost their jobs and needed that money to pay bills and put food on their table but because they were scared. It is scary when you see accounts drop but what people always forget that when accounts drop is good mantra of buy low and sell high. 🙂 The smart investor rode it out, invested more money if they could and reaped the rewards. And yes, how much you set aside for your retirement savings is definitely an area you do not want to “keep up” with your peers as they likely saving too little or not even saving. Thanks, it’s so true about investing during down markets. At the time it was an easy decision because we had literally JUST started investing when the markets dropped. We were in our 20s and early 30s, so we knew we had years and years left to keep investing and “make back” any amounts lost. I think it would be a lot harder to stay calm if we were older and had more in the market, but I think that’s why you always hear the advice to keep less in stocks as you get older- that way if stocks drop as you’re ready to retire you have money in other baskets that you can draw from while you’re waiting for the markets to rebound. Isn’t it amazing that people look at you like you’re from another planet when you mention trying to save anything over 10%? It truly is! Or more frequently it amazes me when I meet people my age (mid-30s) who have barely even begun to think about saving for retirement. Thanks Hayley! It sounds like you are well on your way! I think one of the biggest paradoxes about personal finance is that in order to leverage your financial potential the most, you have to start early- when you are in your 20s or maybe even your teens. And of course those are the members of the population who are least likely to have a care about retirement! As a result, I think a LOT of people end up not starting saving in their 20s or even 30s or later. I think the most important thing is that you have recognized what needs to be done and you’re taking steps toward your goals! The 401/403 and Roth can’t be accessed without penalty prior to 59 1/2. I’m 39 and I just started contributing to a 457B, which acts like a 401k, but is accessible the minute i quit my job. So when i retire early, i’ll be able to fund my household bills with the 457 while the 401/403 grows. Also, if you think you’ll be in a lower tax bracket when you retire than the one you’re in now, you should think of contributing to a Traditional IRA instead. The yearly contributions are tax deductible (Roth are not), but when you withdraw, you pay at the rate you’re at then. Not at the rate you’re at now, which is what you pay when contributing to a Roth IRA. You are partially correct- you can’t access the 401/403 prior to age 59.5. But you can totally access your Roth prior to age 59.5, but the caveat is that you can only withdraw up to the amount that you put in- you can’t withdraw any of the growth prior to then. I think the bottom line is that it’s important to start saving for retirement, no matter the retirement vehicle. For us, we’d way rather contribute to a Roth than a traditional IRA because when we go to take it out we can withdraw that money from the Roth tax-free. So for us investing in our 30s, we know we’ll have a lot of time for growth and compounding and it will hopefully be a pretty hefty amount by the time we go to withdraw. So it will be an awesome perk to not have to pay taxes on that money. To each his own, though. You make a good point that if you’ll be in a lower tax bracket you may come out ahead. Good post! I am currently at 12% – 6% to meet employer match in 401k, and 6% in an employer offered Roth 401k (which is a great deal to look into – you get the Roth tax free benefits, but can contribute up to 401k limits instead of the lower Roth limits!). I really need to ratchet this up some more, but we’ve got some debt to pay down before I shift gears. Something to consider if you are looking for pre 59 1/2 income from your retirement savings is setting up a 72t distribution. Personally, I haven’t spent a terrible amount of time looking into it, but I know it’s a path to receiving income distributions from your 401k before 59 1/2 and without the 10% penalty. You basically roll over your 401k to an IRA, apply for the 72t exception, and use the IRS calculated income stream for 5 years or 59 1/2, whichever comes later, and then your money is back to being free to withdraw as much or little as you want! Just a thought for those people who may be hitting retirement sooner than 59 1/2 and want to be able to access that money…pros and cons of course, but at least something to consider. That’s excellent! My new employer offers a Roth 401(K) as well, and that is what I am currently investing my retirement dollars in. I am currently investing all of my 401(k) dollars in the Roth option though rather than splitting it. I’m curious as to what made you decide to split it- would you mind sharing? Thanks for mentioning the 72T distribution option. It’s honestly not something I have spent a whole lot of time looking into at this point because we are probably quite a few years away from needing to do that- both the hubs and I are still working right now and even after I stop working to be a mom he will keep working for probably quite a few more years. But I will definitely be looking into that when the time comes. Best of luck to you on your retirement goals! I love the idea of “ratcheting up your goal” a percentage or two each year. It’s never too hard to find a little room in the budget for a small increase. Over time those little increases definitely add up! Exactly! And when you make small incremental increases, you really don’t feel the pinch like you otherwise would!